A woman walks under a Cuban flag in 2012 in Santiago de Cuba, Cuba. Nearly 15 years ago, President Bill Clinton authorized federal agents to return Elian Gonzalez, who had been rescued at sea and sent to live with relatives in Florida, to his father in Cuba. The outcry from the Cuban community in Florida was loud and may have cost Al Gore the presidency in 2000. But we shouldn’t expect anything close to the same political ramifications after President Obama’s announcement that the United States will restore full diplomatic relations with Cuba and open an embassy in Havana. Opinions on U.S.-Cuban relations have changed vastly in the past 15 years. The Cuban Research Institute at Florida International University has been polling Cuban-Americans living in South Florida since 1991. 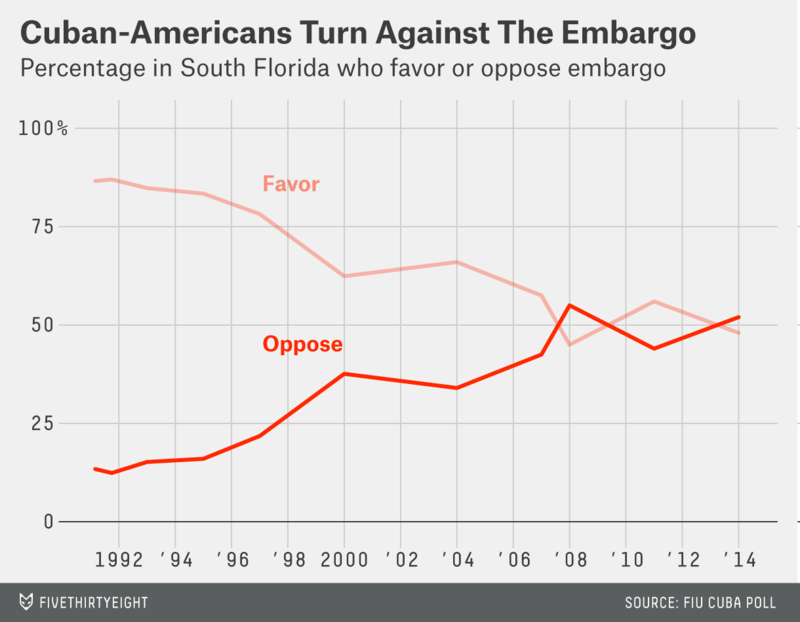 On the embargo question, Cuban-Americans had favored maintaining or strengthening it; today, a slight majority oppose it. Only 48 percent favor the embargo. That compares with 87 percent when the question was first asked 23 years ago and 62 percent in 2000. Although all generations have turned more against the embargo in recent years, opposition to it is especially strong among those who have recently arrived from Cuba. Only 42 percent of those who came to the U.S. in the past 20 years are in favor of keeping it, compared with a majority of those who came before 1994. Cuban-Americans older than 65 favor continuing it; all age groups below 65 oppose it. Finally, Cuban-Americans in Florida made up only 6 percent of all Florida voters in 2012. That means for the embargo to have much of an electoral impact, there would have to be a big backlash from the Cuban-American community. It doesn’t look like that’s going to happen.